This Sunday at St. Paul’s, Nobleton, I’m going to be talking about control – specifically, about letting go of control. It’s not an easy subject for any of us to consider, because we live our lives around issues of control. At first, we have no control – we’re helpless and vulnerable. Then, our parents teach us to be in control – how to get dressed, how to read and write, how to act appropriately. When we come to faith in Christ, however, we hear the Lord telling us that it’s better if we’re not in control, that we let him be in control. By that time, however, we tend to be in a pretty well-set control rut. It’s hard to give it up. In this Advent season, I can think of no better example of someone who gave up control than Mary, the mother of our Lord Jesus Christ. Here is this young teenager, betrothed to an older man but not yet married, who encounters an angel. The angel says that she’s highly favoured, because God has chosen her to become pregnant with his Son. For any ordinary Jewish girl of the day, being found to be pregnant but not yet married would bring her life crashing down around her. Her beloved would send her packing, and her community (including her family) would probably line up to stone her to death. One can imagine that Mary may not, then, have found the idea of becoming pregnant – even by supernatural means – to leave her feeling “highly favoured”. But Mary was no ordinary Jewish girl, it seems, if her response is any indication. What was Mary’s response? Did she run away screaming? (That might be the natural response of anyone standing before a representative of the Lord; remember that the shepherds who were told the news of Jesus’ birth by an angel were terrified!) No. Mary simply said, “I am the Lord’s servant. May everything you have said about me come true” (Luke 1.38a, NLT). Mary gave up control. She served a God whom she trusted to take control. And because of that selfless act of submission, she became the mother of the Messiah, the Anointed One of God, the incarnation (putting skin on) of the Second Person of the Trinity. Because Mary gave up control to God, the world is not the same. What if you and I were to give up control to God? Many of us say we have, but we have a habit of holding little bits back. What if we gave it up, whole-hog? Think of the power that would exist in your church and mine. Think of what God could do with an entire kingdom full of his servants willing to do whatever it takes to fulfill the divine will. That’s enough power to change the world. 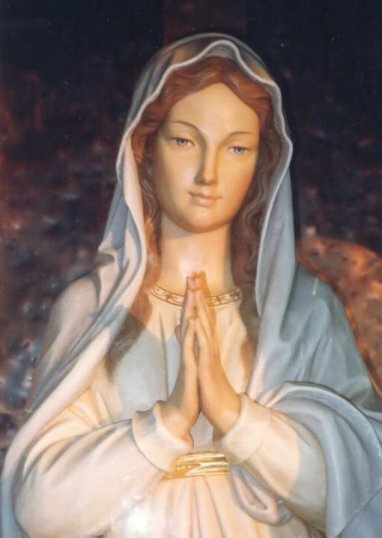 Mary’s willingness to give up power over herself changed the world. And so can ours.